First day totals: Powell, 292; Kercheval, 68; Williams, 56. Second day totals: Powell, 87; Kercheval, 16; Williams, 10. Third day totals: Powell, 117; Kercheval, 55; Williams, 29. Fourth day totals: Powell, 84; Kercheval, 20; Williams, 9. 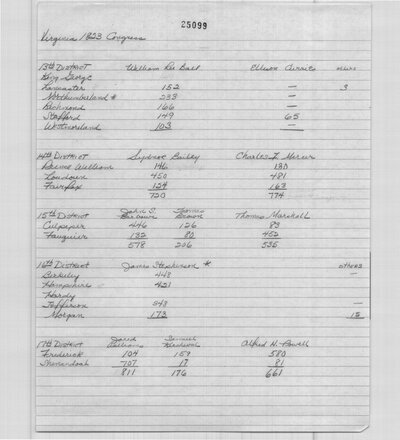 "The Election for the County commenced last Monday, respecting which we are authorized to state the following facts, -- Mr. Williams polled, on Monday, 472 votes, -- Mr. Powell 62, thus leaving Mr. Powell a majority in the District of 66. Early however, in the day (say one o'clock) Mr. Williams declared to Mr. Powel that the Polls must be kept open; the latter expressed his astonishment at the proposition, alledging that there was no possible ground to authorize such a steMr. Williams addressed a Note to the High Sheriff, who was then at the Tavern, requesting him to determine upon the subject. Anticipating that such an attempt would be made, the Sheriff had been previously assured by different persons that the river was perfectly passable; -- he however repaired to the Court House, when Mr. Powel declared that if it could be made manifest that the river was not passable at every point, he would acquiese and agree that the polls should be continued open. -- The Sheriff was again assured that the river was passable; and this fact was clearly demonstrated by the circumstance of different persons, then present, having with safety crosed it that day. -- Every thing that could be urged upon the subject was however unavailing; -- the Sheriff declared that the polls must be adjourned over! 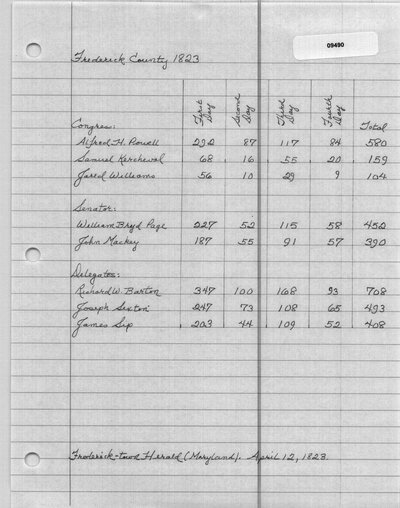 Mr. Powell formally protested against the procedure, and, in the evening, retired from the Poll and left the County. At the close of the Polls on Wednesday, they stood - For Mr. Williams, 707, Mr. Powell, 81, Mr. Kerchaval, 17. Admitting the Election to have been legally conducted, of which, by the by, there exist very strong doubts, Mr. Williams' majority over Mr. Powell is precisely 150. 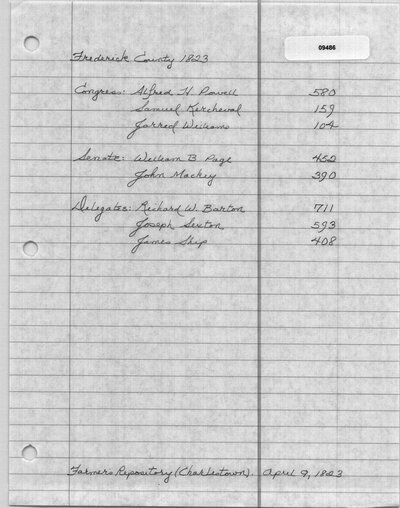 -- It is Mr. Powell's intention to contest the Election, and of this he has given Mr. W. formal notice.-- A circumstance of singular character occurred during the controversy relative to continuing open the Polls, which merits notice -- There were three Candidates for the Assembly; -- Messrs. Bare, Rinker and Buck; the two former were a head of the latter several hundred, and were appealed to by the Sheriff whether it was their wish that the Polls should be continued open, and they gravely decided in the affirmative! It is proper to remark that two slight showers of rain fell in the course of Monday, -- when it was found that the plea of 'High waters' was not very tenable, the friends of Mr. Williams seized hold of that circumstance and urged it a sufficient cause for adjourning the Polls. We were not present at the Election, but have been assured of the truth of the facts we have stated, and have been authorized so to do -- We forbear to comment upon various instances of indecent and highly improper conduct which we were informed characterized the first day's election." Winchester Gazette (Winchester, VA). April 12, 1823. "Mr. Powell, we understand, intends to contest the election, on account of the poll being kept open three days in Shenandoah county, contrary to his wish, and the law. Mr. Powell and Mr. Williams both live in Frederick, but were in Shenandoah the first day, at the close of which Mr. Powell was still 66 votes ahead in the district. He left the county in the evening, and Mr. Williams had the polls kept open two days longer, and finally came out 150 votes majority." Western Monitor (Lexington, KY.). May 2, 1823. 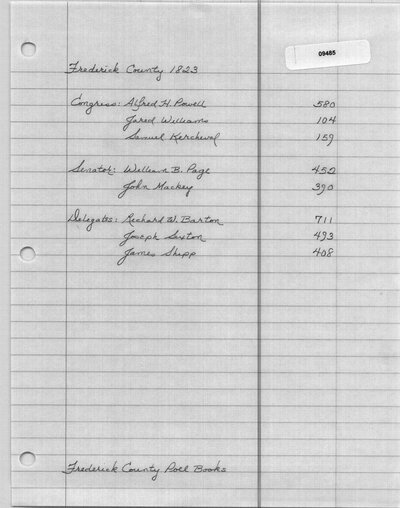 Frederick County Poll Book. Library of Virginia, Richmond. Farmer's Repository (Charlestown, WV). 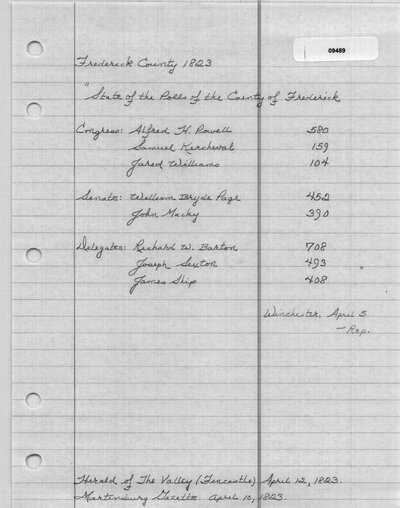 April 9, 1823. Alexandria Gazette and Advertiser (Alexandria, VA). April 10, 1823. Martinsburgh Gazette (Martinsburg, WV). April 10, 1823. The Petersburg Republican (Petersburg, VA). April 11, 1823. Daily National Intelligencer (Washington, DC). April 12, 1823. Frederick-Town Herald (Fredericktown, MD). April 12, 1823. Herald of the Valley (Fincastle, VA). April 12, 1823. The Virginia Herald (Fredericksburg, VA). April 12, 1823. Winchester Gazette (Winchester, VA). 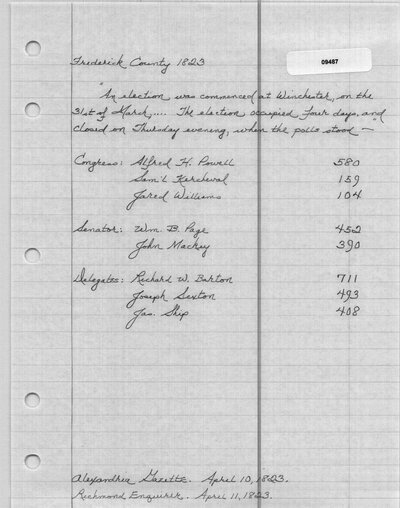 April 12, 1823. The Alexandria Herald (Alexandria, VA). April 14, 1823. Daily National Intelligencer (Washington, DC). April 16, 1823. Farmer's Repository (Charlestown, WV). April 16, 1823. Martinsburgh Gazette (Martinsburg, WV). April 17, 1823. American Commercial Beacon and Norfolk and Portsmouth Daily Advertiser (Norfolk, VA). April 18, 1823. Herald of the Valley (Fincastle, VA). April 19, 1823. The Virginia Herald (Fredericksburg, VA). April 19, 1823. Western Monitor (Lexington, KY.). May 2, 1823.